A new home’s sq. footage doesn’t necessarily include all of the home. LEESBURG/HAMILTON, VA — While measuring sq. footage for new home living rooms, bedrooms, baths, etc., pretty much follows industry guidelines, the actual whole house sq. footage total could be confusing. Here’s why. Some builders might list sq. footage that includes the main level, upper level and lower level (basement) whether the basement is finished or not. Others might not list the sq. footage at all unless you ask for it. 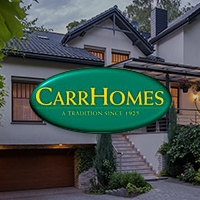 At CarrHomes we only list the “finished living space” sq. footage (usually the main level and upper level of a home). After all, if the basement is “unfinished” (no walls, ceilings or flooring) it’s not really livable space. So why count it? Take the Lancaster model at our Waterford Creek community in Hamilton, VA., for example. We show sq. footage as 4522 sq. feet (on two levels). But, if you choose to have the basement finished (with rec room, den, media/exercise room, etc.) the home’s sq. footage can easily top 6600 sq. feet, making our Lancaster model and all our Waterford Creek models some of the largest new homes in the region. So when you’re comparing new homes you should ask about sq. footage and make certain to ask if the total includes unfinished as well as finished space. By-the-way, if you also compare Waterford Creek’s new wooded 3-acre homesites with most other area builders’ tree-less sites, than you’re really comparing apples and oranges.